The following are descriptions of popular and past beers brewed at Wolf Hills. This is not a complete list; all current tap selections can be found listed on the main page. An approachable and very drinkable lower ABV session beer, Honey Cream Ale has a malt backbone of Pale malt with Honey malt, Caramel 40, and flaked corn. 10 pounds of wildflower honey are added to the end of the boil to enhance the sweet character. Hopped with traditional Czech Saaz and fermented with an English ale yeast, White Blaze is a crowd favorite and great for people just discovering craft beer. Our new and improved flagship IPA features a blast of dry hops to enhance the hop aroma and flavor characteristic of newer American IPAs. An old-school malt bill features a bit of Caramel 40 for light sweetness and color and a bit of Vienna malt for malt complexity. 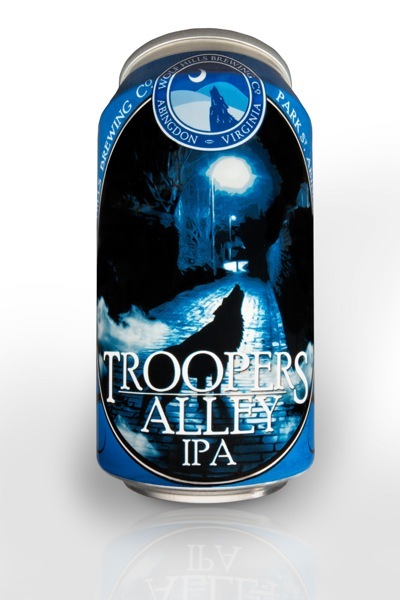 We hop Trooper’s with traditional American citrus hops Cascade and Centennial at the end of boil and in the dry hop. Though slightly hoppier this is a traditional American Amber Ale featuring a complex malt bill. In addition to the pale base malts we add Caramel 60 for color, caramalt for head retention, and a wee bit of chocolate malt for complexity and color. Hopped with Willamette for an earthy balance. When we opened the brewery in 2009 you couldn’t find Double IPAs within 100 miles. So we made one. A simple malt bill of Pale malt with some Golden Naked Oats for body lets the hops shine through. A blend of Citra, Amarillo, Centennial, and Cascade provide a blast of hop flavor and aroma – mostly from dry hopping over 1 pound per barrel. We often sneak El Dorado, Azeca, Mosaic, and other new hops to keep you on your toes! A lighter and more variable IPA than the Wolf’s Den this is a sweeter evolving IPA providing a bit more mouthfeel and body to balance the hop load. We also minimize the early hop additions to keep the bitterness lower than was typical for early IPAs. We often experiment with each batch changing the hop varietals to both learn about and enjoy new hop varieties and old favorites. It’s all for science, right? Typical varieties include Amarillo, Azeca, Citra, El Dorado, and Mosaic but we are always up for something new. This type of ancient German sour beer comes from a time when all beer was sour because we didn’t understand sanitation and the process of fermentation. To achieve the sourness we add lactobacillus planarum bacteria to this beer prior to boiling or ‘kettle sour’. The bacteria ‘sour’ the wort and bring the pH from about 4.9 to 3.3 providing a tart smoothness. After the wort is soured, we boil as usual killing the bacteria and sterilizing the wort. We add coriander for spice and salt for unique mouthfeel before fermenting with regular ale yeast. After fermentation we add a variety of pureed fruit. Typically we add 84 pounds of blackberry puree but will often half this with raspberries for more tart flavors. We have added mango and look forward to making Gose with various fruits in the future. Named after the man who would preach from the pulpit with a rifle by his side to protect early Abingdonians from village raids. This is our take on a traditional American Pale Ale showcasing hop flavor and aroma. Like Troopers, we add a bit of Vienna to an otherwise stark malt bill to get out of the way of the hops. Heavily dry hopped with Amarillo, Cascade, and Centennial. A lower ABV version of and IPA so you can have several. A softer, less bitter, fruitier version of a traditional American IPA. Hazy IPAs are characterized by hopping the beer while it’s fermenting so the yeast can interact with hops to produce novel flavors of citrus juice. Mostly Sunny is our evolving version of this newly emerging style of IPA. We add a heavy charge of new hop varieties during fermentation followed by another charge of the same hops once fermentation is finished. We push 4 pounds of hops per barrel after the kettle. Hazy IPAs are far less bitter because very few hops are added to the kettle where heat can create bitterness from the hops. The haze is caused by the reactants from the yeast and hops together and not actual yeast suspended in the beer. The softness of the mouthfeel is due to the malted wheat and Golden Naked Oats in the grain bill. Our take on the most common beer style available anywhere. A clean, crisp heavily drinkable beer characterized primarily by using lager yeast that ferments cold and slow. Flatpicker is simple and features pilsner malt, German Tradition hops, and lager yeast. Because the beer is so simple there is little room for error. We hope you enjoy our version of this worldwide beer style. In the style of ‘dessert’ or ‘pastry’ stout this is a sweet porter enhanced by the finest pecan extract we could find. Porters are the kitchen sink of beer s and at one time was the dominant beer style around the globe. Our porter features Honey malt, Caramel 40, Chocolate malt, and Black Patent for color. Northern Brewer hops add an earthy spiciness to balance the sweet. Blackstrap molasses is also added during the boil for flavor and fermentability, raising the ABV. This is our collaboration beer made with cold brewed Zazzy’s coffee made by Lincoln Road Cold Coffee. Oatmeal in the mash plus coffee in the finish. Sounds like a good breakfast to me. Chocolate and Pale chocolate malts dominate the grain bill for color and flavor. A touch of Roasted Barley enhances the astringency and dryness of the finish – like a dark black coffee. At times we will add lactose sugar (milk sugar) to the boil for those who prefer cream in their coffee. Northern Brewer and Willamette hops. Unlike the pilsner, which is a traditional European style, our Pale lager is an American version of a dry, crisp, refreshing thirst quencher. Pislner malt and lager yeast dominate, with german hops to balance. Less bitter than the Flatpicker we often dry hop this beer with an American (citrusy) hop variety for an added punch. Our traditional, celebratory Marzen style lager features more complex malts than a pilsner. German Pilsner malt, Vienna, Munich, and Best Red provide a bready sweetness balanced by German Tradition hops. A special strain of Oktoberfest yeast is used to ferment this beer for several weeks longer than usual to allow the complex malt flavors to express themselves. A hybrid style between a caramelly sweet brown ale and an IPA and based on a popular homebrew recipe this beer offers a high degree of complexity. Five different malts including wheat, caramel 40, and chocolate provide a solid malt sweetness while a mix of earthy and citrus hops blend for balance. Sweet and hoppy this beer is also dry hopped with centennial for a grapefruit like citrus flavor. Unusual and atypical but we hope you enjoy. Wolf Hills has three wine barrels from Abingdon Vineyard and four whiskey barrels from Davis Valley Distilleries in Rural Retreat. We always have something aging in them and release it on tap when it’s ready. Here are a few we have enjoyed in the past. Naya was fermented with a traditional Trappist yeast that provides a clove-like spiciness and fruit character to the finished beer. A mix of wild yeasts and bacteria was added when the beer was racked to a whiskey barrel. During a four month aging period the beer developed a slight sourness and robust oak flavor from the barrel. Hints of whiskey. We are currently re-using this barrel for an Oud Bruin. Boozy Belgian tripel aged in a wine barrel for a year and dosed with Brettanomyces, a yeast that ferments beer further than traditional saccharomyces beer yeast. Brett has dried this beer out to a terminal gravity of near zero. Brett also adds some fruity and a few funky flavors. The barrel contributes to the dryness with a bit of woody character. The original beer contained Belgian candi sugar which attributes to the sweetness, though the beer is still dry. Before Brett this beer was almost too sweet. The brett has rounded this out to a nice drinkability. Some may remember because this was last year’s 8th anniversary beer. I stole some and put it in a barrel. Some may compare it to the world famous Duvel made in a similar way, though that would be a huge compliment and a bit of a stretch. Extremely decadent, silky sweet, and boozy. The Dire Wolf is our take on a big stout and aged in whiskey barrels for several months. Dark, roasty malts including roasted barley and chocolate. Heavily hopped with traditional East Kent Golding hops and American Ale yeast. Two ages will be released through winter 2018-2019 with the second aged longer for more whiskey and oak character. SRM: Standard Reference Method. A simplified approximation of beer lightness or darkness. Pilsners are low SRM (3-2) and stouts very high. Past about 40 most beers look black. SRM is a measure of light penetration and really isn’t an indicator of color but provides an estimate of light to dark. IBU: International Bitterness Units. A measure of hop bitterness usually coming from boil or kettle hop additions. Heat removes bitterness from hops and is traditionally used to balance malt sweetness. Nowadays we add hops at various parts of the brewing process to feature flavors and aromas that do not add to bitterness very much. IBU beyond 100 is said to be beyond the threshold of human perception, but high IBU beers are typically more bitter. Below about 30 beers are likely to be sweet and beyond 50 or 60 one can detect a very apparent bitterness. Also am imperfect measure but provides some estimate of bitterness in beer. ABV: Alcohol by Volume. Craft beers are typically higher in alcohol than traditional mass-produced beers. Often standard beers are around 4%. Gage yourself accordingly. Malt: Malted Barley. Dried and/or roasted to varying degrees to impart a wide variety of flavors from bread, honey, chocolate, and caramel. Hop: Flowers from the female hop vine. Provide bitterness when boiled and incredible aroma and flavor when added when beer is cool. Interesting fact, the hops plants’ only direct relative is cannabis. Dry hop: Hops added after fermentation when beer is typically finished and ready to carbonate and keg. Imparts flavor and aroma rather than bitterness, which comes from kettle hops added during the boil.